Free Shipping Included! 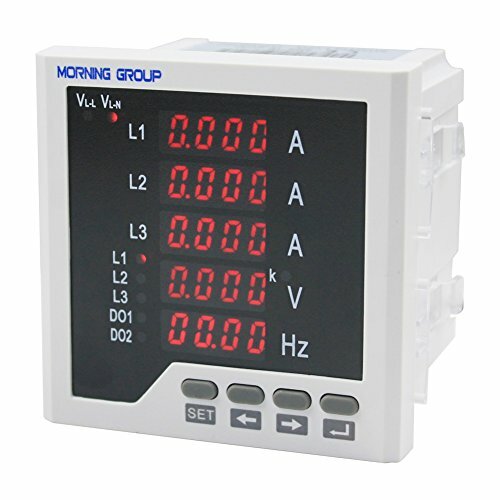 Morning Group 3 Phase LED Digital Display Multifunction Current Voltage Frequency Meter(Three Phase (Panel Size:3.78 3.78in)) by Morning Group at N Online Agency. Hurry! Limited time offer. Offer valid only while supplies last. 1. Introduction: The Combined Panel Meter Can Measure Three Phase Voltage, Current and Frequency ,Also Can Work With Current Transformer. The Combined Panel Meter Can Measure Three Phase Voltage, Current and Frequency ,Also Can Work With Current Transformer. 1.★Wide Range of Power Supply:AC/DC 85-265V. 2.★Multifunction:Measure Three Phase Voltage, Current and Frequency ,Also Can Work With Current Transformer. 3.★Proper Size: 96x96mm(3.78x3.78in),Hole Size is 92x92mm(3.62x3.62in),Depth is 78mm(3.07in). 4.★Easy Operation and Easy Installation:With Plastic Clasp,LED Display, Visual Menus, Simple Wiring. 5.★5 Rows Display:Clear Date and Read easily. If you have any questions about this product by Morning Group, contact us by completing and submitting the form below. If you are looking for a specif part number, please include it with your message.